Situated only 15 kilometres from the shores of the Mediterranean Sea and moments away from the picturesque Canal du Midi, L'air Marin boasts a tropical climate and relaxing activities for the entire family. As always, LUX-Camp is pleased to be able to provide additional information upon request. Why Should I Camp at L´air Marin? 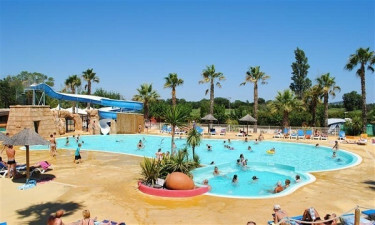 This luxury camping site is less than 20 minutes from Béziers Airport. A massive on-site water park. A tranquil atmosphere punctuated by palm trees. Both a bar and a restaurant are located within this resort. These will be open every year during the height of the tourist season. An eatery specifically catering to takeaway orders is likewise available. 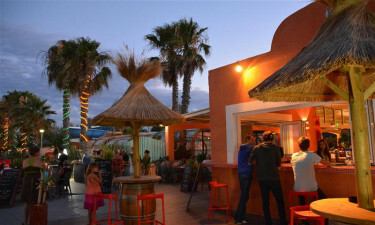 Food provision facilities offer all of the most common produce items while a bakery and a snack food outlet are ideal for a quick bite before heading out to the sandy shores found only moments away. There is a large open-air pool found directly within the confines of L'air Marin. A water slide is ideal for children and, during the cooler months of the year, an indoor pool is heated for the pleasure of guests. Sandy beaches which overlook the Mediterranean Sea are found only 1 kilometre from the camp site. Angling, sailing, surfing and boat hire are all possible from these shores. Some notably modern facilities which provide a further sense of camping luxury include wireless Internet, a gas bottle exchange, a laundrette and dedicated power supplies to each pitch.